Aaron Finch, Australia’s Twenty20 captain and one of the most explosive batsmen in world cricket, will make his Yorkshire return in a Second XI game at Barnsley CC’s Shaw Lane tomorrow. Finch, who has missed the last seven weeks after suffering a hamstring tear playing for the Mumbai Indians in the Indian Premier League, has arrived in England ahead of his stint with Yorkshire and will play for the second team in two Twenty20 matches against Northamptonshire, the first of which starts at 11.30am. “I’m looking forward to playing this week,” said Finch, who arrived in Leeds last weekend after completing his rehabilitation in his native Australia. “I’m in a good place and can’t wait to help the side out. I’ve had a couple of nets and I’m feeling good. 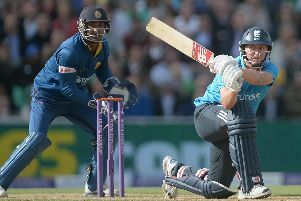 “I will play the two T20 matches arranged at Barnsley and I’m hoping I can hit the ground running. “It is great to be back at Yorkshire. I’ve missed being with the boys. This is a great club that breeds winners. Finch enjoyed a successful spell at Headingley last season. He scored 256 runs in ten T20 innings, including a sparkling 89 against Lancashire at Old Trafford, and also averaged over 48 in six County Championship innings as Yorkshire secured their first four-day title since 2001.